Black-Litterman model is widely used for asset allocation, however, most of its applications are based on the assumption of normally distributed markets and views. In this paper Beyond Black-Litterman in Practice: A Five-Step Recipe to Input Views on Non-Normal Markets, the author Attilio Meucci extent the Black-Litterman model to allow non-normal distribution assumption, specifically, skew t distribution is used for markets and uniform distribution is for investors views as examples. The author also present general steps to implement the approach in practice. As a fan of this model, I plan to write two posts on the paper, the pros and cons of Black litterman will be discussed, and a robust analysis will be shown to demonstrate its consistence. Markowitz mean-variance model is the foundation of modern portfolio theory, it tries to maximize return and minimize risk by carefully choosing different assets. Although Markowitz model is widely used in practice in the financial industry, it has at least the following shortcomings. First, in principle the Markowitz model offers a solution once the expected returns and covariance of the assets are known. Although the covariance of a few assets can be adequately estimated, it is difficult to come up with reasonable estimates of expected returns. Initial estimates often lead to extreme portfolio solutions and have to be adjusted many times before they can be considered acceptable by the decision makers. Second, Markowitz model assumes the future distribution of assets returns will be exactly the same as that of historical returns, therefore it does not allow an investor to have views on the direction of assets growth. Black-Litterman model bypasses these problems by not requiring the user to input estimates of expected return; instead it assumes that the initial expected returns are whatever is required so that the equilibrium asset allocation is equal to what we observe in the markets. The user is only required to state how his assumptions about expected returns differ from the market's and to state his degree of confidence in the alternative assumptions. From this, the Black-Litterman model computes the desired mean-variance efficient asset allocation. It is right because of this character that makes Black-Litterman model be popular both in industry and academia since it was initially developed in 1990. 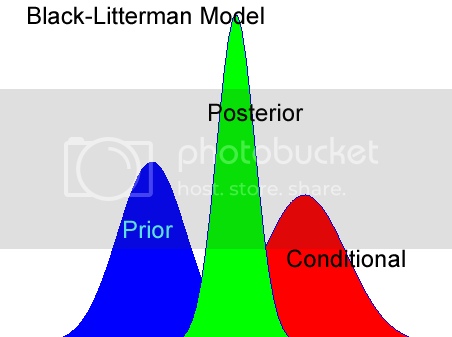 However, the original Black-Litterman model helps portfolio managers to compute the distribution of the posterior market that incorporates their subjective views with respect to the prior distribution. All these assumptions are being made considering the entire scenario is normally distributed. In fact, it is frequently observed that returns in equity and other markets are not normally distributed. At the same time, you would expect a practitioner to input his views in a less informative manner. For instance, instead of a view like ‘I am 90% sure that stock A will have a 2% expected return’, he may have a more accurate view such as ‘I am 90% sure that the return of stock A will stay between -1% and 1% with equal chance’, or for an Asian option Trader, his views may be a set of prices at several specific monitoring times, when the option is supposed to be exercised. Meucci (2006) solves the above-mentioned issues of the original Black-Litterman model by developing an approach called Copula-Opinion Pooling (COP), the author relaxes the normal distribution assumption and in principle allows any distribution. However, the proposed implementation in the paper has a distinct distribution under certain assumptions. Indeed, the market has been assumed to be skew-t distributed, this strong assumption makes the application of the approach less evident, although the implementation is pretty straightforward for any distribution by Monte Carlo simulation, because Monte Carlo simulation can be applied for almost any distribution and is suitable for any dimension (at least in theory), COP approach can handle a portfolio with any number of risk factors. The second part will be about the Matlab implementation and results analysis.